A delegation featuring Brett McGurk, the United States' envoy to the coalition it leads against Islamic State (IS, formerly ISIS/ISIL), met the YPG over the last weekend in January. The YPG took full control of Kobane late last June, in what was a powerful symbol of Kurdish resistance. "He [Brett McGurk] visits Kobane at the time of the Geneva talks and is awarded a plaque by a so-called YPG general?" Erdogan told reporters on his plane while returning from a trip to Latin America and Senegal, the Beser Haber newspaper reported. "How can we trust [you]?" Erdogan said. "Is it me who is your partner, or the terrorists in Kobane?" the Turkish president said, adding that both the PYD and the YPG are "terrorist organizations." Ankara considers them to be part of the PKK, banned in Turkey as a terrorist group. According to US officials, the trip appeared to be the first of its kind to northern Syria since 2013. It took place after the YPG's political wing, Syria’s Democratic Union Party (PYD), was excluded from new peace talks in Geneva. Ankara had threatened to boycott the talks if the PYD were invited. The conflict between the Turkish government and Kurdish insurgent groups demanding greater autonomy for the large ethnic group has been continuing for decades. With several failed ceasefires between the sides, Ankara has been blamed by a number of human rights groups for putting civilian lives at risk in Turkey's mainly Kurdish southeast. In August, Ankara launched a ground operation to crack down on Kurdish fighters linked to the Kurdistan Workers’ Party (PKK). The violence ended a two-year truce with Kurdish militants fighting a guerrilla war for independence. "Islamic State has military bases in Turkey, and is using it as a corridor. Turkey currently plays a role similar to the one Pakistan played in the 1980s. When the Soviet forces were stationed in Afghanistan, jihadists arrived there through Pakistan, along with the money and arms," Abd Salam Ali noted. 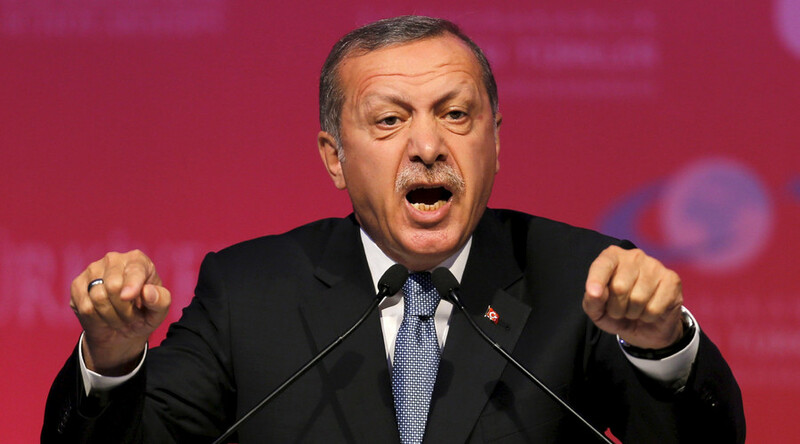 "Now Turkey is exactly the same corridor [for militants in Syria], and it plays its own game. But Kurds appeared to stand in [Ankara's] way. They have forced IS away from Rojava [also known as Syrian Kurdistan]. There's only one piece left, a 90km-long territory between the Kurdish towns. If we force IS out of there and reconnect the Kurdish cantons, Turkey won't be able to influence [the situation in Syria]." Late last month, President Erdogan once again refused to search for a peaceful solution to the conflict, which began back in 1984 and has taken at least 40,000 lives, mainly Kurds. He pledged that "those with guns in their hands and those who support them will pay the price of treason," referring to the Kurdish militants, deemed terrorists by the government. According to Turkey’s General Staff, the number of PKK members killed during military operations in the southeastern districts of Cizre and Sur reached 733 on Sunday. But according to Amnesty International estimates, at least 150 civilians, among them children, have been killed during the Turkish operation, with more than 200,000 lives put at risk. Turkey’s security operations in the mainly Kurdish southeast resemble a “collective punishment,” the human rights watchdog said last month. Amnesty slammed the international community for choosing to turn a blind eye to what Ankara has been doing to the Kurds. “While the Turkish authorities appear determined to silence internal criticism, they have faced very little from the international community. Strategic considerations relating to the conflict in Syria and determined efforts to enlist Turkey’s help in stemming the flow of refugees to Europe must not overshadow allegations of gross human rights violations. The international community must not look the other way,” John Dalhuisen, Amnesty International’s Europe and Central Asia Program Director, pointed out. READ MORE: Turkish security op, curfew in Kurdish areas puts 200,000 people at risk – Amnesty Intl. Up to 21 academics were detained by Turkish authorities in mid-January for signing a petition demanding that Ankara abandon its military crackdown on Kurdish rebels in the southeast of the country. The petition denouncing Turkey’s military operation against Kurds was signed by as many as 1,200 academics. Turkish President Recep Tayyip Erdogan said they all sided with the Kurdish militants, who are considered terrorists by the government. "Unfortunately these so-called academics claim that the state is carrying out a massacre. You, the so-called intellectuals! You are dark people. You are not intellectuals," he stated.